For years people have been requesting posters of our series, but we’ve never been able to afford it. Now we’re hoping we’ll sell enough to break even and offer others in the future. So please, please buy one. 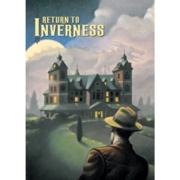 Our first offer is Greg Tucker’s lovely painting for “Return to Inverness”, all ready for framing. Something to be treasured, a future heirloom to pass on to your great-great grandkiddies.